No matter how old we get, we’ll never outgrow the joy of biting into a fluffy waffle. 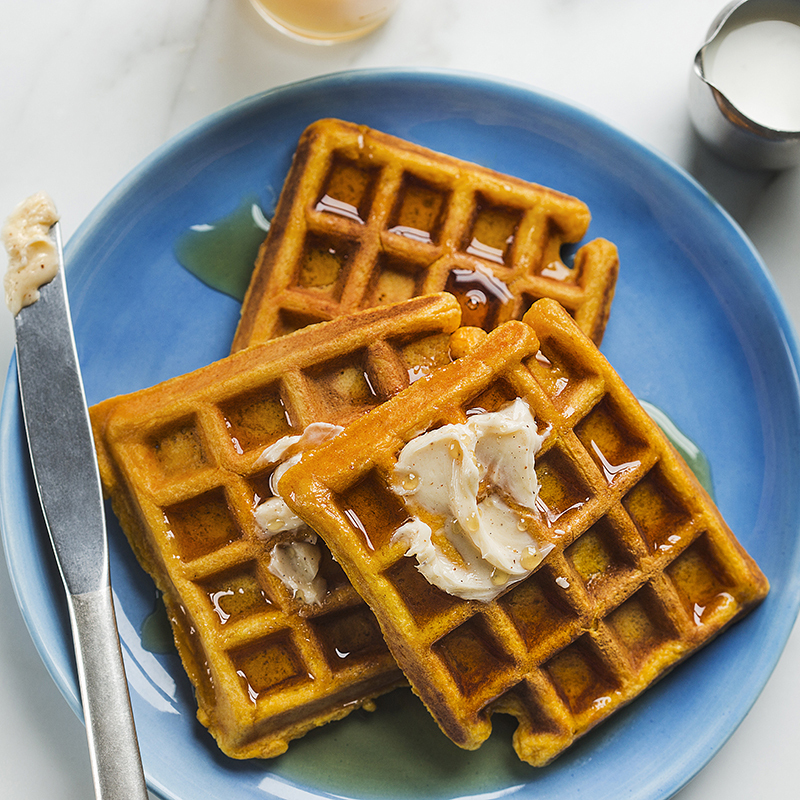 Pump up the flavor this weekend with this Pumpkin Spice Waffle Recipe—made from our vitamin-dense organic Green Valley pumpkin puree, you’ll get added health benefits that aren’t found in traditional waffles. Impress your “brunch-mates” with this gorgeous, good-for-you skillet. This lighter recipe is free from fried tortilla and high-fat cheese, but still packs plenty of punch with smooth avocado, fiber-rich organic Green Valley pinto beans, and sunny side up eggs. A basket of freshly baked muffins is a staple of every brunch spread. Crafted from sweet bananas and high-protein chickpeas, these flourless muffins are much lower in calories and sugar than your average muffin. Just one bite and you’ll have to stop yourself from eating the entire basket! True brunch fans can agree that Avocado Toast is a must-have. This recipe is not only delicious and totally insta-worthy, it’s also packed with nutrients! Plus, there’s no cooking required. Simply top whole-grain bread with organic Green Valley corn, creamy avocado, cheese, and spices. 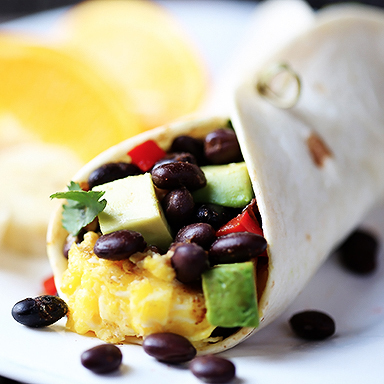 Easy yet oh-so-satisfying, these breakfast burritos are loaded with high-protein black beans and creamy avocado. With only 15 minutes of prep time, these burritos are perfect for when a group of unexpected brunch guests come knocking at your door. Get ready for a total game changer! Hash browns are typically viewed as “off limits” to health-minded people, but by replacing frying with baking, you’ll be able to achieve the same level of crispiness with none of the guilt. Did you know that just one plate of Eggs Benedict could contain your entire daily recommended amount of fat? No need to worry! This better-for-you benedict recipe uses a flavorful, creamy “mock” hollandaise, which contains only a fraction of the fat. If you’re looking to keep brunch low carb, this crust-free veggie quiche is for you. Not only will you significantly lower your calorie intake, you’ll also cut down on the baking time. Easier to make and better for you… it’s a win win! Take oatmeal to a whole new level with this sweet, comforting baked recipe. Free of processed sugar, this high-fiber oatmeal recipe gets its sweetness from natural honey and fruit. It’ll taste so good that you’ll feel like you’re biting into a breakfast cookie! Brunch isn’t just about the food. Just because you’re watching your consumption doesn’t mean you can’t enjoy a cocktail with your meal! Treat yourself by making this Bloody Mary Recipe packed with antioxidants and free of added sugar. 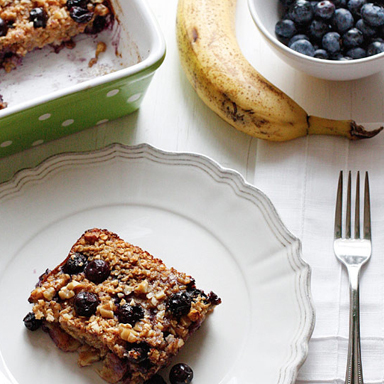 We hope you love these 10 healthy, satisfying brunch recipes as much as we do! Share your pictures on Instagram and don’t forget to tag @ItsGreenValley.